For The Sopranos episode, see Mergers and Acquisitions (The Sopranos). For other uses, see Merge (disambiguation) and Acquisition (disambiguation). From a legal point of view, a merger is a legal consolidation of two entities into one entity, whereas an acquisition occurs when one entity takes ownership of another entity's stock, equity interests or assets. From a commercial and economic point of view, both types of transactions generally result in the consolidation of assets and liabilities under one entity, and the distinction between a "merger" and an "acquisition" is less clear. A transaction legally structured as an acquisition may have the effect of placing one party's business under the indirect ownership of the other party's shareholders, while a transaction legally structured as a merger may give each party's shareholders partial ownership and control of the combined enterprise. A deal may be euphemistically called a merger of equals if both CEOs agree that joining together is in the best interest of both of their companies, while when the deal is unfriendly (that is, when the management of the target company opposes the deal) it may be regarded as an "acquisition". An acquisition/takeover is the purchase of one business or company by another company or other business entity. Specific acquisition targets can be identified through myriad avenues including market research, trade expos, sent up from internal business units, or supply chain analysis. Such purchase may be of 100%, or nearly 100%, of the assets or ownership equity of the acquired entity. Consolidation/amalgamation occurs when two companies combine to form a new enterprise altogether, and neither of the previous companies remains independently. Acquisitions are divided into "private" and "public" acquisitions, depending on whether the acquiree or merging company (also termed a target) is or is not listed on a public stock market. Some public companies rely on acquisitions as an important value creation strategy. An additional dimension or categorization consists of whether an acquisition is friendly or hostile. Achieving acquisition success has proven to be very difficult, while various studies have shown that 50% of acquisitions were unsuccessful. "Serial acquirers" appear to be more successful with M&A than companies who make an acquisition only occasionally (see Douma & Schreuder, 2013, chapter 13). The new forms of buy out created since the crisis are based on serial type acquisitions known as an ECO Buyout which is a co-community ownership buy out and the new generation buy outs of the MIBO (Management Involved or Management & Institution Buy Out) and MEIBO (Management & Employee Involved Buy Out). Look up merger in Wiktionary, the free dictionary. Whether a purchase is perceived as being a "friendly" one or "hostile" depends significantly on how the proposed acquisition is communicated to and perceived by the target company's board of directors, employees and shareholders. It is normal for M&A deal communications to take place in a so-called "confidentiality bubble" wherein the flow of information is restricted pursuant to confidentiality agreements. In the case of a friendly transaction, the companies cooperate in negotiations; in the case of a hostile deal, the board and/or management of the target is unwilling to be bought or the target's board has no prior knowledge of the offer. Hostile acquisitions can, and often do, ultimately become "friendly", as the acquiror secures endorsement of the transaction from the board of the acquiree company. This usually requires an improvement in the terms of the offer and/or through negotiation. "Acquisition" usually refers to a purchase of a smaller firm by a larger one. Sometimes, however, a smaller firm will acquire management control of a larger and/or longer-established company and retain the name of the latter for the post-acquisition combined entity. This is known as a reverse takeover. Another type of acquisition is the reverse merger, a form of transaction that enables a private company to be publicly listed in a relatively short time frame. A reverse merger occurs when a privately held company (often one that has strong prospects and is eager to raise financing) buys a publicly listed shell company, usually one with no business and limited assets. The combined evidence suggests that the shareholders of acquired firms realize significant positive "abnormal returns" while shareholders of the acquiring company are most likely to experience a negative wealth effect. The overall net effect of M&A transactions appears to be positive: almost all studies report positive returns for the investors in the combined buyer and target firms. This implies that M&A creates economic value, presumably by transferring assets to management teams that operate them more efficiently (see Douma & Schreuder, 2013, chapter 13). The buyer buys the shares, and therefore control, of the target company being purchased. Ownership control of the company in turn conveys effective control over the assets of the company, but since the company is acquired intact as a going concern, this form of transaction carries with it all of the liabilities accrued by that business over its past and all of the risks that company faces in its commercial environment. The terms "demerger", "spin-off" and "spin-out" are sometimes used to indicate a situation where one company splits into two, generating a second company which may or may not become separately listed on a stock exchange. An increase in acquisitions in the global business environment requires enterprises to evaluate the key stake holders of acquisition very carefully before implementation. It is imperative for the acquirer to understand this relationship and apply it to its advantage. Employee retention is possible only when resources are exchanged and managed without affecting their independence. Corporate acquisitions can be characterized for legal purposes as either "asset purchases" in which the seller sells business assets to the buyer, or "equity purchases" in which the buyer purchases equity interests in a target company from one or more selling shareholders. Asset purchases are common in technology transactions where the buyer is most interested in particular intellectual property rights but does not want to acquire liabilities or other contractual relationships. An asset purchase structure may also be used when the buyer wishes to buy a particular division or unit of a company which is not a separate legal entity. There are numerous challenges particular to this type of transaction, including isolating the specific assets and liabilities that pertain to the unit, determining whether the unit utilizes services from other units of the selling company, transferring employees, transferring permits and licenses, and ensuring that the seller does not compete with the buyer in the same business area in the future. Structuring the sale of a financially distressed company is uniquely difficult due to the treatment of non-compete covenants, consulting agreements, and business goodwill in such transactions. Mergers, asset purchases and equity purchases are each taxed differently, and the most beneficial structure for tax purposes is highly situation-dependent. One hybrid form often employed for tax purposes is a triangular merger, where the target company merges with a shell company wholly owned by the buyer, thus becoming a subsidiary of the buyer. In a "forward triangular merger", the buyer causes the target company to merge into the subsidiary; a "reverse triangular merger" is similar except that the subsidiary merges into the target company. Under the U.S. Internal Revenue Code, a forward triangular merger is taxed as if the target company sold its assets to the shell company and then liquidated, whereas a reverse triangular merger is taxed as if the target company's shareholders sold their stock in the target company to the buyer. The documentation of an M&A transaction often begins with a letter of intent. The letter of intent generally does not bind the parties to commit to a transaction, but may bind the parties to confidentiality and exclusivity obligations so that the transaction can be considered through a due diligence process involving lawyers, accountants, tax advisors, and other professionals, as well as business people from both sides. Conditions, which must be satisfied before there is an obligation to complete the transaction. Conditions typically include matters such as regulatory approvals and the lack of any material adverse change in the target's business. Representations and warranties by the seller with regard to the company, which are claimed to be true at both the time of signing and the time of closing. Sellers often attempt to craft their representations and warranties with knowledge qualifiers, dictating the level of knowledge applicable and which seller parties' knowledge is relevant. Some agreements provide that if the representations and warranties by the seller prove to be false, the buyer may claim a refund of part of the purchase price, as is common in transactions involving privately held companies (although in most acquisition agreements involving public company targets, the representations and warranties of the seller do not survive the closing). Representations regarding a target company's net working capital are a common source of post-closing disputes. Post-closing, adjustments may still occur to certain provisions of the purchase agreement, including the purchase price. These adjustments are subject to enforceability issues in certain situations. Alternatively, certain transactions use the 'locked box' approach where the purchase price is fixed at signing and based on seller’s equity value at a pre-signing date and an interest charge. Most often value is expressed in a Letter of Opinion of Value (LOV) when the business is being valued informally. Formal valuation reports generally get more detailed and expensive as the size of a company increases, but this is not always the case as the nature of the business and the industry it is operating in can influence the complexity of the valuation task. Objectively evaluating the historical and prospective performance of a business is a challenge faced by many. Generally, parties rely on independent third parties to conduct due diligence studies or business assessments. To yield the most value from a business assessment, objectives should be clearly defined and the right resources should be chosen to conduct the assessment in the available timeframe. As synergy plays a large role in the valuation of acquisitions, it is paramount to get the value of synergies right. Synergies are different from the "sales price" valuation of the firm, as they will accrue to the buyer. Hence, the analysis should be done from the acquiring firm's point of view. Synergy-creating investments are started by the choice of the acquirer, and therefore they are not obligatory, making them essentially real options. To include this real options aspect into analysis of acquisition targets is one interesting issue that has been studied lately. Payment by cash. Such transactions are usually termed acquisitions rather than mergers because the shareholders of the target company are removed from the picture and the target comes under the (indirect) control of the bidder's shareholders. Payment in the form of the acquiring company's stock, issued to the shareholders of the acquired company at a given ratio proportional to the valuation of the latter. They receive stock in the company that is purchasing the smaller subsidiary. Cash on hand: it consumes financial slack (excess cash or unused debt capacity) and may decrease debt rating. There are no major transaction costs. Issue of debt: It consumes financial slack, may decrease debt rating and increase cost of debt. Transaction costs include underwriting or closing costs of 1% to 3% of the face value. Issue of stock: it increases financial slack, may improve debt rating and reduce cost of debt. Transaction costs include fees for preparation of a proxy statement, an extraordinary shareholder meeting and registration. Issue of stock (same effects and transaction costs as described above). Shares in treasury: it increases financial slack (if they don’t have to be repurchased on the market), may improve debt rating and reduce cost of debt. Transaction costs include brokerage fees if shares are repurchased in the market otherwise there are no major costs. In general, stock will create financial flexibility. Transaction costs must also be considered but tend to affect the payment decision more for larger transactions. Finally, paying cash or with shares is a way to signal value to the other party, e.g. : buyers tend to offer stock when they believe their shares are overvalued and cash when undervalued. Parties should also consider their accounting treatment of M&A transaction costs and ensure they comply with Department of Treasury regulations, including the applicability of the "end of the day" and "next day" rules. M&A advice is provided by full-service investment banks- who often advise and handle the biggest deals in the world (called bulge bracket) - and specialist M&A firms, who provide M&A only advisory, generally to mid-market, select industries and SBEs. Highly focused and specialized M&A advice investment banks are called boutique investment banks. Synergy: For example, managerial economies such as the increased opportunity of managerial specialization. Another example is purchasing economies due to increased order size and associated bulk-buying discounts. Vertical integration: Vertical integration occurs when an upstream and downstream firm merge (or one acquires the other). There are several reasons for this to occur. One reason is to internalise an externality problem. A common example of such an externality is double marginalization. Double marginalization occurs when both the upstream and downstream firms have monopoly power and each firm reduces output from the competitive level to the monopoly level, creating two deadweight losses. After a merger, the vertically integrated firm can collect one deadweight loss by setting the downstream firm's output to the competitive level. This increases profits and consumer surplus. A merger that creates a vertically integrated firm can be profitable. Hiring: some companies use acquisitions as an alternative to the normal hiring process. This is especially common when the target is a small private company or is in the startup phase. In this case, the acquiring company simply hires ("acquhires") the staff of the target private company, thereby acquiring its talent (if that is its main asset and appeal). The target private company simply dissolves and few legal issues are involved. Absorption of similar businesses under single management: similar portfolio invested by two different mutual funds namely united money market fund and united growth and income fund, caused the management to absorb united money market fund into united growth and income fund. Access to hidden or nonperforming assets (land, real estate). Acquire innovative intellectual property. Nowadays, intellectual property has become one of the core competences for companies. Studies have shown that successful knowledge transfer and integration after a merger or acquisition has a positive impact to the firm's innovative capability and performance. Megadeals—deals of at least one $1 billion in size—tend to fall into four discrete categories: consolidation, capabilities extension, technology-driven market transformation, and going private. A horizontal merger is usually between two companies in the same business sector. An example of horizontal merger would be if a video game publisher purchases another video game publisher, for instance, Square Enix acquiring Eidos Interactive. This means that synergy can be obtained through many forms such as; increased market share, cost savings and exploring new market opportunities. A vertical merger represents the buying of supplier of a business. In a similar example, if a video game publisher purchases a video game development company in order to retain the development studio's intellectual properties, for instance, Kadokawa Corporation acquiring FromSoftware. The vertical buying is aimed at reducing overhead cost of operations and economy of scale. Conglomerate M&A is the third form of M&A process which deals the merger between two irrelevant companies. The relevant example of conglomerate M&A would be if a video game publisher purchases an animation studio, for instance, when Sega Sammy Holdings subsidized TMS Entertainment. The objective is often diversification of goods and services and capital investment. The M&A process results in the restructuring of a business' purpose, corporate governance and brand identity. A statutory merger is a merger in which the acquiring company survives and the target company dissolves. The purpose of this merger is to transfer the assets and capital of the target company into the acquiring company without having to maintain the target company as a subsidiary. A consolidated merger is a merger in which an entirely new legal company is formed through combining the acquiring and target company. The purpose of this merger is to create a new legal entity with the capital and assets of the merged acquirer and target company. Both the acquiring and target company are dissolved in the process. A Strategic merger usually refers to long term strategic holding of target (Acquired) firm. This type of M&A process aims at creating synergies in the long run by increased market share, broad customer base, and corporate strength of business. A strategic acquirer may also be willing to pay a premium offer to target firm in the outlook of the synergy value created after M&A process. The term "acqui-hire" is used to refer to acquisitions where the acquiring company seeks to obtain the target company's talent, rather than their products (which are often discontinued as part of the acquisition so the team can focus on projects for their new employer). In recent years, these types of acquisitions have become common in the technology industry, where major web companies such as Facebook, Twitter, and Yahoo! have frequently used talent acquisitions to add expertise in particular areas to their workforces. Merger of equals is often a combination of companies of a similar size. Since 1990, there have been more than 625 M&A transactions announced as mergers of equals with a total value of USD 2,164.4 bil. Some of the largest mergers of equals took place during the dot.com bubble of the late 1990s and in the year 2000: AOL and Time Warner (USD 164 bil. ), SmithKline Beecham and Glaxo Wellcome (USD 75 bil. ), Citicorp and Travelers Group (USD 72 bil.). More recent examples this type of combinations are DuPont and Dow Chemical (USD 62 bil.) and Praxair and Linde (USD 35 bil.). An analysis of 1,600 companies across industries revealed the rewards for M&A activity were greater for consumer products companies than the average company. For the period 2000-2010, consumer products companies turned in an average annual TSR of 7.4%, while the average for all companies was 4.8%. Given that the cost of replacing an executive can run over 100% of his or her annual salary, any investment of time and energy in re-recruitment will likely pay for itself many times over if it helps a business retain just a handful of key players that would have otherwise left. Organizations should move rapidly to re-recruit key managers. It’s much easier to succeed with a team of quality players that one selects deliberately rather than try to win a game with those who randomly show up to play. Keep one name and discontinue the other. The strongest legacy brand with the best prospects for the future lives on. In the merger of United Airlines and Continental Airlines, the United brand will continue forward, while Continental is retired. Keep one name and demote the other. The strongest name becomes the company name and the weaker one is demoted to a divisional brand or product brand. An example is Caterpillar Inc. keeping the Bucyrus International name. Keep both names and use them together. Some companies try to please everyone and keep the value of both brands by using them together. This can create an unwieldy name, as in the case of PricewaterhouseCoopers, which has since changed its brand name to "PwC". Discard both legacy names and adopt a totally new one. The classic example is the merger of Bell Atlantic with GTE, which became Verizon Communications. Not every merger with a new name is successful. By consolidating into YRC Worldwide, the company lost the considerable value of both Yellow Freight and Roadway Corp. The factors influencing brand decisions in a merger or acquisition transaction can range from political to tactical. Ego can drive choice just as well as rational factors such as brand value and costs involved with changing brands. Beyond the bigger issue of what to call the company after the transaction comes the ongoing detailed choices about what divisional, product and service brands to keep. The detailed decisions about the brand portfolio are covered under the topic brand architecture. Replica of an East Indiaman of the Dutch East India Company/United East India Company (VOC). A pioneering early model of the public company and multinational corporation in its modern sense, the VOC was formed in 1602 from a government-directed consolidation/amalgamation of several competing Dutch trading companies (the so-called voorcompagnieën). It was possibly in fact the first recorded major consolidation and is generally one of the most successful mergers (in particular amalgamations) in the history of business. Most histories of M&A begin in the late 19th century United States. However, mergers coincide historically with the existence of companies. In 1708, for example, the East India Company merged with an erstwhile competitor to restore its monopoly over the Indian trade. In 1784, the Italian Monte dei Paschi and Monte Pio banks were united as the Monti Reuniti. In 1821, the Hudson's Bay Company merged with the rival North West Company. The Great Merger Movement was a predominantly U.S. business phenomenon that happened from 1895 to 1905. During this time, small firms with little market share consolidated with similar firms to form large, powerful institutions that dominated their markets. It is estimated that more than 1,800 of these firms disappeared into consolidations, many of which acquired substantial shares of the markets in which they operated. The vehicle used were so-called trusts. In 1900 the value of firms acquired in mergers was 20% of GDP. In 1990 the value was only 3% and from 1998 to 2000 it was around 10–11% of GDP. Companies such as DuPont, U.S. Steel, and General Electric that merged during the Great Merger Movement were able to keep their dominance in their respective sectors through 1929, and in some cases today, due to growing technological advances of their products, patents, and brand recognition by their customers. There were also other companies that held the greatest market share in 1905 but at the same time did not have the competitive advantages of the companies like DuPont and General Electric. These companies such as International Paper and American Chicle saw their market share decrease significantly by 1929 as smaller competitors joined forces with each other and provided much more competition. The companies that merged were mass producers of homogeneous goods that could exploit the efficiencies of large volume production. In addition, many of these mergers were capital-intensive. Due to high fixed costs, when demand fell, these newly merged companies had an incentive to maintain output and reduce prices. However more often than not mergers were "quick mergers". These "quick mergers" involved mergers of companies with unrelated technology and different management. As a result, the efficiency gains associated with mergers were not present. The new and bigger company would actually face higher costs than competitors because of these technological and managerial differences. Thus, the mergers were not done to see large efficiency gains, they were in fact done because that was the trend at the time. Companies which had specific fine products, like fine writing paper, earned their profits on high margin rather than volume and took no part in the Great Merger Movement. One of the major short run factors that sparked the Great Merger Movement was the desire to keep prices high. However, high prices attracted the entry of new firms into the industry. A major catalyst behind the Great Merger Movement was the Panic of 1893, which led to a major decline in demand for many homogeneous goods. For producers of homogeneous goods, when demand falls, these producers have more of an incentive to maintain output and cut prices, in order to spread out the high fixed costs these producers faced (i.e. lowering cost per unit) and the desire to exploit efficiencies of maximum volume production. However, during the Panic of 1893, the fall in demand led to a steep fall in prices. Another economic model proposed by Naomi R. Lamoreaux for explaining the steep price falls is to view the involved firms acting as monopolies in their respective markets. As quasi-monopolists, firms set quantity where marginal cost equals marginal revenue and price where this quantity intersects demand. When the Panic of 1893 hit, demand fell and along with demand, the firm’s marginal revenue fell as well. Given high fixed costs, the new price was below average total cost, resulting in a loss. However, also being in a high fixed costs industry, these costs can be spread out through greater production (i.e. Higher quantity produced). To return to the quasi-monopoly model, in order for a firm to earn profit, firms would steal part of another firm’s market share by dropping their price slightly and producing to the point where higher quantity and lower price exceeded their average total cost. As other firms joined this practice, prices began falling everywhere and a price war ensued. One strategy to keep prices high and to maintain profitability was for producers of the same good to collude with each other and form associations, also known as cartels. These cartels were thus able to raise prices right away, sometimes more than doubling prices. However, these prices set by cartels provided only a short-term solution because cartel members would cheat on each other by setting a lower price than the price set by the cartel. Also, the high price set by the cartel would encourage new firms to enter the industry and offer competitive pricing, causing prices to fall once again. As a result, these cartels did not succeed in maintaining high prices for a period of more than a few years. The most viable solution to this problem was for firms to merge, through horizontal integration, with other top firms in the market in order to control a large market share and thus successfully set a higher price. In the long run, due to desire to keep costs low, it was advantageous for firms to merge and reduce their transportation costs thus producing and transporting from one location rather than various sites of different companies as in the past. Low transport costs, coupled with economies of scale also increased firm size by two- to fourfold during the second half of the nineteenth century. In addition, technological changes prior to the merger movement within companies increased the efficient size of plants with capital intensive assembly lines allowing for economies of scale. Thus improved technology and transportation were forerunners to the Great Merger Movement. In part due to competitors as mentioned above, and in part due to the government, however, many of these initially successful mergers were eventually dismantled. The U.S. government passed the Sherman Act in 1890, setting rules against price fixing and monopolies. Starting in the 1890s with such cases as Addyston Pipe and Steel Company v. United States, the courts attacked large companies for strategizing with others or within their own companies to maximize profits. Price fixing with competitors created a greater incentive for companies to unite and merge under one name so that they were not competitors anymore and technically not price fixing. During the third merger wave (1965–1989), corporate marriages involved more diverse companies. Acquirers more frequently bought into different industries. Sometimes this was done to smooth out cyclical bumps, to diversify, the hope being that it would hedge an investment portfolio. Starting in the fifth merger wave (1992–1998) and continuing today, companies are more likely to acquire in the same business, or close to it, firms that complement and strengthen an acquirer’s capacity to serve customers. In recent decades however, cross-sector convergence has become more common. For example, retail companies are buying tech or e-commerce firms to acquire new markets and revenue streams. It has been reported that convergence will remain a key trend in M&A activity through 2015 and onward. Buyers aren’t necessarily hungry for the target companies’ hard assets. Some are more interested in acquiring thoughts, methodologies, people and relationships. Paul Graham recognized this in his 2005 essay "Hiring is Obsolete", in which he theorizes that the free market is better at identifying talent, and that traditional hiring practices do not follow the principles of free market because they depend a lot upon credentials and university degrees. Graham was probably the first to identify the trend in which large companies such as Google, Yahoo! or Microsoft were choosing to acquire startups instead of hiring new recruits, a process known as acqui-hiring. Many companies are being bought for their patents, licenses, market share, name brand, research staff, methods, customer base, or culture. Soft capital, like this, is very perishable, fragile, and fluid. Integrating it usually takes more finesse and expertise than integrating machinery, real estate, inventory and other tangibles. The top ten largest deals in M&A history cumulate to a total value of 1,118,963 mil. USD. (1.118 tril. USD). In a study conducted in 2000 by Lehman Brothers, it was found that, on average, large M&A deals cause the domestic currency of the target corporation to appreciate by 1% relative to the acquirer's local currency. Until 2018, around 280.472 cross-border deals have been conducted, which cumulates to a total value of almost 24,069 bil. USD. The rise of globalization has exponentially increased the necessity for agencies such as the Mergers and Acquisitions International Clearing (MAIC), trust accounts and securities clearing services for Like-Kind Exchanges for cross-border M&A. On a global basis, the value of cross-border mergers and acquisitions rose seven-fold during the 1990s. In 1997 alone, there were over 2,333 cross-border transactions, worth a total of approximately $298 billion. The vast literature on empirical studies over value creation in cross-border M&A is not conclusive, but points to higher returns in cross-border M&As compared to domestic ones when the acquirer firm has the capability to exploit resources and knowledge of the target's firm and of handling challenges. In China, for example, securing regulatory approval can be complex due to an extensive group of various stakeholders at each level of government. In the United Kingdom, acquirers may face pension regulators with significant powers, in addition to an overall M&A environment that is generally more seller-friendly than the U.S. Nonetheless, the current surge in global cross-border M&A has been called the "New Era of Global Economic Discovery". In little more than a decade, M&A deals in China increased by a factor of 20, from 69 in 2000 to more than 1,300 in 2013. In 2014, Europe registered its highest levels of M&A deal activity since the financial crisis. Driven by U.S. and Asian acquirers, inbound M&A, at $320.6 billion, reached record highs by both deal value and deal count since 2001. Approximately 23 percent of the 416 M&A deals announced in the U.S. M&A market in 2014 involved non-U.S. acquirers. For 2016, market uncertainties, including Brexit and the potential reform from a U.S. Presidential election, contributed to cross-border M&A activity lagging roughly 20% behind 2015 activity. In 2017, the controverse trend which started in 2015, decreasing total value but rising total number of cross border deals, kept going. Compared on a year on year basis (2016-2017), the total number of cross border deals decreased by -4.2%, while cumulated value increased by 0.6%. Even mergers of companies with headquarters in the same country can often be considered international in scale and require MAIC custodial services. For example, when Boeing acquired McDonnell Douglas, the two American companies had to integrate operations in dozens of countries around the world (1997). This is just as true for other apparently "single-country" mergers, such as the 29 billion-dollar merger of Swiss drug makers Sandoz and Ciba-Geigy (now Novartis). M&A practice in emerging countries differs from more mature economies, although transaction management and valuation tools (e.g. DCF, comparables) share a common basic methodology. In China, India or Brazil for example, differences affect the formation of asset price and on the structuring of deals. Profitability expectations (e.g. shorter time horizon, no terminal value due to low visibility) and risk represented by a discount rate must both be properly adjusted. In a M&A perspective, differences between emerging and more mature economies include: i) a less developed system of property rights, ii) less reliable financial information, iii) cultural differences in negotiations, and iv) a higher degree of competition for the best targets. Property rights: the capacity to transfer property rights and legally enforce the protection of such rights after payment may be questionable. Property transfer through the Stock Purchase Agreement can be imperfect (e.g. no real warranties) and even reversible (e.g. one of the multiple administrative authorizations needed not granted after closing) leading to situations where costly remedial actions may be necessary. When the rule of law is not established, corruption can be a rampant problem. Information: documentation delivered to a buyer may be scarce with a limited level of reliability. As an example, double sets of accounting are common practice and blur the capacity to form a correct judgment. Running valuation on such basis bears the risk to lead to erroneous conclusions. Therefore, building a reliable knowledge base on observable facts and on the result of focused due diligences, such as recurring profitability measured by EBITDA, is a good starting point. Negotiation: “Yes” may not be synonym that the parties have reached an agreement. Getting immediately to the point may not be considered appropriate in some cultures and even considered rude. The negotiations may continue to the last minute, sometimes even after the deal has been officially closed, if the seller keeps some leverage, like a minority stake, in the divested entity. Therefore, establishing a strong local business network before starting acquisitions is usually a prerequisite to get to know trustable parties to deal with and have allies. Competition: the race to acquire the best companies in an emerging economy can generate a high degree of competition and inflate transaction prices, as a consequence of limited available targets. This may push for poor management decisions; before investment, time is always needed to build a reliable set of information on the competitive landscape. If not properly dealt with, these factors will likely have adverse consequences on return-on-investment (ROI) and create difficulties in day-to-day business operations. It is advisable that M&A tools designed for mature economies are not directly used in emerging markets without some adjustment. M&A teams need time to adapt and understand the key operating differences between their home environment and their new market. Despite the goal of performance improvement, results from mergers and acquisitions (M&A) are often disappointing compared with results predicted or expected. Numerous empirical studies show high failure rates of M&A deals. Studies are mostly focused on individual determinants. A book by Thomas Straub (2007) "Reasons for frequent failure in Mergers and Acquisitions" develops a comprehensive research framework that bridges different perspectives and promotes an understanding of factors underlying M&A performance in business research and scholarship. The study should help managers in the decision making process. The first important step towards this objective is the development of a common frame of reference that spans conflicting theoretical assumptions from different perspectives. On this basis, a comprehensive framework is proposed with which to understand the origins of M&A performance better and address the problem of fragmentation by integrating the most important competing perspectives in respect of studies on M&A. Furthermore, according to the existing literature, relevant determinants of firm performance are derived from each dimension of the model. For the dimension strategic management, the six strategic variables: market similarity, market complementarities, production operation similarity, production operation complementarities, market power, and purchasing power were identified as having an important effect on M&A performance. For the dimension organizational behavior, the variables acquisition experience, relative size, and cultural differences were found to be important. Finally, relevant determinants of M&A performance from the financial field were acquisition premium, bidding process, and due diligence. Three different ways in order to best measure post M&A performance are recognized: synergy realization, absolute performance, and finally relative performance. Employee turnover contributes to M&A failures. The turnover in target companies is double the turnover experienced in non-merged firms for the ten years after the merger. ^ Wang, William Yu Chung; Pauleen,, David; Chan, HingKai. "Facilitating the merger of multinational companies A case study of the Global Virtual Enterprise". Journal of Global Information Management, (2013), 21(1), 42-58. ^ Rumyantseva, Maria, Grzegorz Gurgul, and Ellen Enkel. "Knowledge Integration after Mergers & Acquisitions." University of Mississippi Business Department. University of Mississippi, July 2002. ^ Ranft, Annette L., and Michael D. Lord. "Acquiring new technologies and capabilities: A grounded model of acquisition implementation." Organization science 13.4 (2002): 420-441. ^ Moore, Jim. "Get acquired! An idiot's guide to technology M&A". Retrieved 19 August 2013. ^ a b "Mergers & Acquisitions Quick Reference Guide" (PDF). McKenna Long & Aldridge LLP. Retrieved 19 August 2013. ^ Griffin, William F. "Tax Aspects of Corporate Mergers and Acquisitions" (PDF). Davis Malm & D'Agostine, P.C. Archived from the original (PDF) on 11 May 2013. Retrieved 19 August 2013. ^ Barusch, Ronald. "WSJ M&A 101: A Guide to Merger Agreements". WSJ Deal Journal. Retrieved 19 August 2013. ^ Collan, Mikael; Kinnunen Jani (2011). "A Procedure for the Rapid Pre-acquisition Screening of Target Companies Using the Pay-off Method for Real Option Valuation". Journal of Real Options and Strategy. 4 (1): 117–141. ^ King, D. R.; Slotegraaf, R.; Kesner, I. (2008). "Performance implications of firm resource interactions in the acquisition of R&D-intensive firms". Organization Science. 19 (2): 327–340. doi:10.1287/orsc.1070.0313. ^ Maddigan, Ruth; Zaima, Janis (1985). "The Profitability of Vertical Integration". Managerial and Decision Economics. 6 (3): 178–179. doi:10.1002/mde.4090060310. ^ Ng, Artie W.; Chatzkel, Jay; Lau, K.F. ; Macbeth, Douglas (2012-07-20). "Dynamics of Chinese emerging multinationals in cross‐border mergers and acquisitions". Journal of Intellectual Capital. 13 (3): 416–438. doi:10.1108/14691931211248963. ISSN 1469-1930. ^ Zhang, Yu; Wu, Xianming; Zhang, Hao; Lyu, Chan; Zhang, Yu; Wu, Xianming; Zhang, Hao; Lyu, Chan (2018-05-30). "Cross-Border M&A and the Acquirers' Innovation Performance: An Empirical Study in China". Sustainability. 10 (6): 1796. doi:10.3390/su10061796. ^ King, D. R.; Dalton, D. R.; Daily, C. M.; Covin, J. G. (2004). "Meta-analyses of Post-acquisition Performance: Indications of Unidentified Moderators". Strategic Management Journal. 25 (2): 187–200. doi:10.1002/smj.371. ^ "From Software acquired by Japanese publisher Kadokawa Corporation". Engadget. Retrieved 2017-12-10. ^ "Notice Concerning Exchange of Shares to Convert Sammy NetWorks Co., Ltd., SEGA TOYS CO., LTD. and TMS ENTERTAINMENT, LTD. into Wholly Owned Subsidiaries of SEGA SAMMY HOLDINGS INC" (PDF). Sega Sammy Holdings Inc. 27 August 2010. Retrieved 9 January 2017. ^ a b "MERGER & CONSOLIDATION: OVERVIEW". www.shsu.edu. Retrieved 2017-12-10. ^ In re Cox Communications, Inc. Shareholders Litig., 879 A.2d 604, 606 (Del. Ch. 2005). ^ Hof, Robert. "Attention Startups: Here's How To Get Acqui-Hired By Google, Yahoo Or Twitter". Forbes. Retrieved 9 January 2014. ^ "M&A by Transaction Type - IMAA-Institute". IMAA-Institute. Retrieved 2016-12-22. ^ "NewsBeast And Other Merger Name Options « Merriam Associates, Inc. Brand Strategies". Merriamassociates.com. Archived from the original on 2012-11-06. Retrieved 2012-12-18. ^ a b "Caterpillar's New Legs—Acquiring the Bucyrus International Brand « Merriam Associates, Inc. Brand Strategies". Merriamassociates.com. Archived from the original on 2012-10-30. Retrieved 2012-12-18. ^ De Jong, Abe; Gelderblom, Oscar; Jonker, Joost (2010), 'An Admiralty for Asia: Isaac le Maire and Conflicting Conceptions About the Corporate Governance of the VOC'. (Working Paper Erasmus Research Institute of Management, 2010). Gelderblom, de Jong, and Jonker (2010)"(...) In 1597 Van Oldenbarnevelt started pushing for a consolidation because the continuing competition threatened to compromise the Dutch fight against Spain and Portugal in Asia (Den Heijer 2005, 41). The companies of Middelburg and Veere followed the Amsterdam example and merged into one Verenigde Zeeuwse Compagnie in 1600. The idea for a merger between the all companies, first considered in 1599, then reappeared, given new momentum by the emergence of the East India Company in Britain. (...) Negotiations between the Dutch companies took a long time because of conflicting demands. Firstly, the Estates General wanted the merger to secure a strong Dutch presence in Asia. The hot rivalry between the voorcompagnieën undermined the country's fragile political unity and economic prosperity, and seriously limited the prospects of competing successfully against other Asian traders from Europe. By attacking the Luso-Hispanic overseas empire, a large, united company would also help in the ongoing war against the Spanish Habsburgs. Initially Van Oldenbarnevelt thought of no more than two or three manned strongholds (Van Deventer 1862, 301), but the Estates General wanted an offensive (Van Brakel 1908, 20-21)." 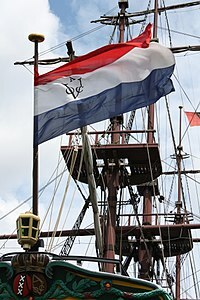 ^ Gelderblom, Oscar; de Jong, Abe; Jonker, Joost (2011), 'An Admiralty for Asia: Business Organization and the Evolution of Corporate Governance in the Dutch Republic, 1590–1640,'; in J.G. Koppell (ed. ), Origins of Shareholder Advocacy. (New York: Palgrave Macmillan, 2011), pp. 29–70. Gelderblom, Jonker & de Jong (2010): "The hot rivalry between the voorcompagnieën undermined the country's fragile political unity and economic prosperity, and seriously limited the prospects of competing successfully against other Asian traders from Europe. ... According to Willem Usselincx, a large merchant well versed in the intercontinental trade, the VOC charter was drafted by bewindhebbers bent on defending their own interests and the Estates General had allowed that to pass so as to achieve the desired merger (Van Rees 1868, 410). An agreement was finally reached on March 20th, 1602, after which the Estates General issued a charter granting a monopoly on the Asian trade for 21 years (Gaastra 2009, 21-23)." ^ "Monte dei Paschi di Siena Bank | About us | History | The Lorraine reform". 2009-03-17. Retrieved 2012-12-18. ^ Lamoreaux, Naomi R. "The great merger movement in American business, 1895-1904." Cambridge University Press, 1985. ^ "Insights | KPMG | ZA". KPMG. 2016-11-15. Retrieved 2017-12-11. ^ "Corporate America's Dealmakers Are Cross-Pollinating". www.bloomberg.com. Retrieved 2018-10-18. ^ "Hiring is Obsolete". Retrieved 18 February 2015. ^ "M&A Statistics - Worldwide, Regions, Industries & Countries". Institute for Mergers, Acquisitions and Alliances (IMAA). Retrieved 2018-02-28. ^ United Nations Conference on Trade and Development, 2000, World Investment Report 2000: Cross-border Mergers and Acquisitions and Development (Overview), New York and Geneva, p. 10. ^ Ayisi-Cromwell, M. "The New Era of Global Economic Discovery: Opportunities and Challenges". Thomson Reuters Emerging Markets Investment Forum. New York, NY. 19 Sep. 2012. Chairman’s Opening Remarks. ^ "M&A by Transaction Type - IMAA-Institute". IMAA-Institute. Retrieved 2018-02-22. Aharon, D.Y. ; Gavious, I.; Yosef, R. (2010). "Stock market bubble effects on mergers and acquisitions" (PDF). The Quarterly Review of Economics and Finance. 50 (4): 456–470. doi:10.1016/j.qref.2010.05.002. Close, John Weir. A Giant Cow-tipping by Savages: The Boom, Bust, and Boom Culture of M&A. New York: Palgrave Macmilla. ISBN 9780230341814. OCLC 828246072. Coispeau, Olivier; Luo, Stephane (2015). Mergers & Acquisitions and Partnerships in China. Singapore: World Scientific. p. 311. ISBN 9789814641029. OCLC 898052215. Fleuriet, Michel (2008). Investment Banking explained: An insider's guide to the industry. New York, NY: McGraw Hill. ISBN 978-0-07-149733-6. Locke, Bryan; Singh, Harsh; Chung, Joanna; Ferguson, John J. "Selling Acquisitions to Institutional Investors, Proxy Handlers, Regulators, and the Financial Media". Transaction Advisors. ISSN 2329-9134. Locke, Firmex; Inc, Divestopedia; Inc. "The 2017 M&A Fee Guide". Firmex & Divestopedia. Popp, Karl Michael (2013). Mergers and Acquisitions in the Software Industry - foundations of due diligence. Norderstedt: Books on demand. ISBN 978-3-7322-4381-5. Reddy, K.S. ; Nangia, V.K. ; Agrawal, R. (2013). "Indian economic-policy reforms, bank mergers, and lawful proposals: The ex-ante and ex-post 'lookup'". Journal of Policy Modeling. 35 (4): 601–622. doi:10.1016/j.jpolmod.2012.12.001. Reddy, K.S. ; Agrawal, R.; Nangia, V.K. (2013). "Reengineering, crafting and comparing business valuation models-the advisory exemplar". International Journal of Commerce and Management. 23 (3): 216–241. doi:10.1108/IJCoMA-07-2011-0018.